*Based on US Dietary Guidelines of 48g of whole grain a day. 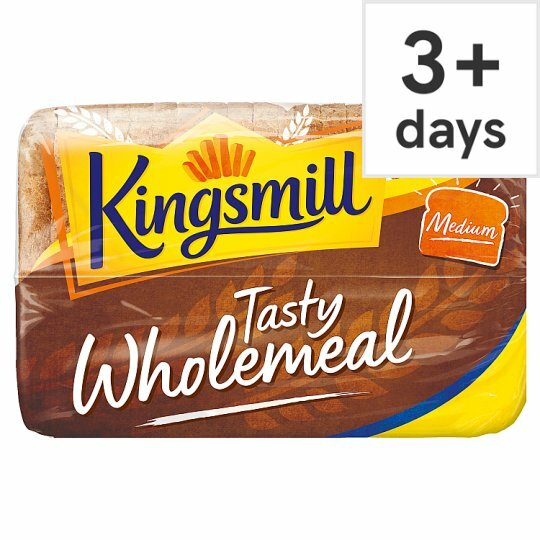 Kingsmill's bakers use flour from our own mills to bring you deliciously soft, great-tasting bakery every day. With tasty malted wheat, our Wholemeal loaf is the perfect choice for your family. Store in a cool, dry place- ideally not refrigerated. Under warm conditions life may be reduced., Suitable for home freezing: Want to save some for later?, Check bag is sealed and then pop me in the freezer and I'll keep for 3 months., For best before see bag closure. Call Customer Care for free from anywhere in the UK on 0800 197 0110 anytime between 9am-5pm Monday to Friday. For ROI, call 1800 928 110. This does not affect your statutory rights.